Administrators can change holders of business cards and Reports for each user. Please use this function when a business card has been scanned with the wrong holder selected or when a user resigns from your company. Here we will show how to use this function. There are two ways of changing holders. This is a way of moving business cards by only selecting the current holder of the business cards and the new holder. Pattern B: Changing "some of" the business cards and Reports held by a specified holder. This is a way of moving some business cards by selecting the current holder and the new holder, using tags attached to the business cards to be moved. -Time required to move business cards can range from just a few minutes to over 24 hours at the longest. -Cards selected for this process that have been recognized as the same person (past cards) will be included in this process. -Business cards currently being transcribing cannot have their holders changed. -For changing the holder of Reports, the person registering the Report will be changed. Users who are set to be internal attendees of meetings are not the people who will become the holders of the reports. -Opportunity representatives and people registered to Opportunities will not be changed by this process. 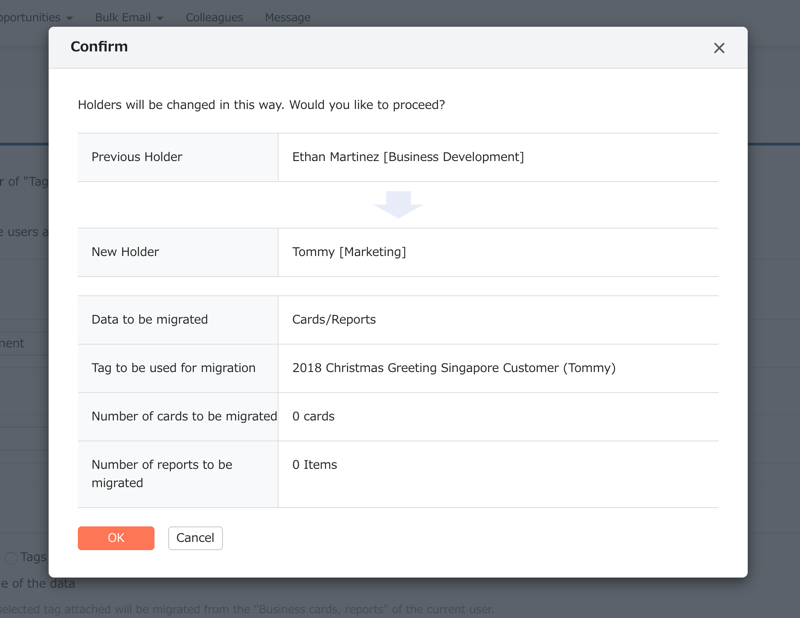 For either pattern A or pattern B, when the process for changing holder is complete, a tag will be automatically added to the cards that have been changed. This tag will be a public My Tag of the new holder of the cards. They will be named by the following rule. Specify only the holders, and all the business cards and Reports that user has will be moved. 1. Select current (before change) holder, and new holder (after change). 2. Select "Cards/Reports" for content to be changed. After that, do not select "Migrate only some data". 3. Confirm the contents of the change, and then press "OK". 4.In the "Operation status list" section, the status "Reserved" will appear. 5. When the status changes to "Complete", the tag change is done. B: When changing some of the business cards and Reports held by a specified holder. -This will move only cards and Reports with a specified tag added to them held by the specified user. Before doing this, the tag for changing holders must be attached. For how to do this, see here. The tag to be used for changing holders should be made by the new holder(after change) or by some other person except the except the current holder(before change) of the cards. 1. 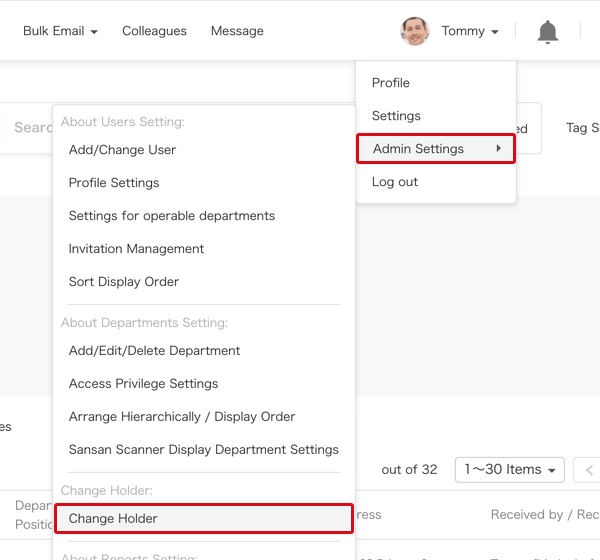 Select the current holder (before change) and the new holder (after change). 2. Select "Cards/Reports" for content to be changed. 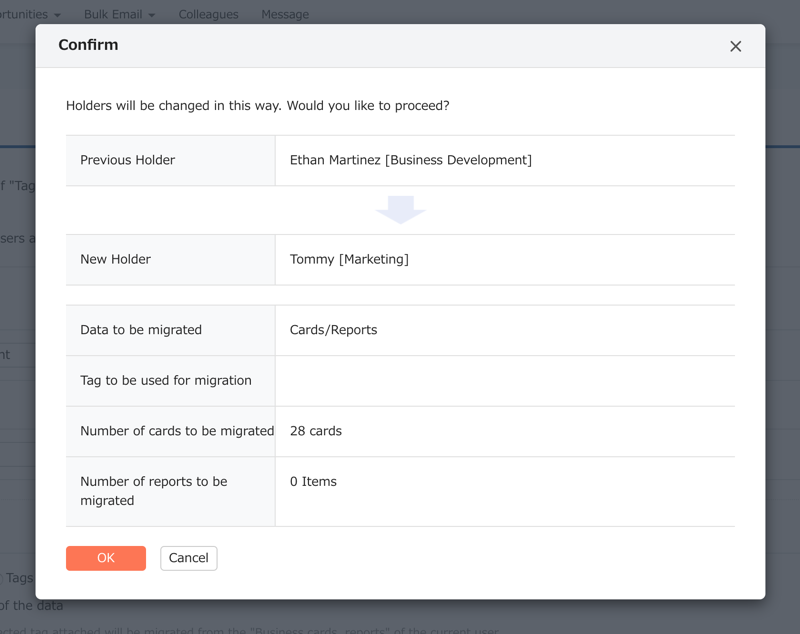 After that, select "Migrate only some data" and choose tags. After that click on "Check what will be changed". 3. After confirming the contents of the change, click on "OK".